Nearly one million school-aged children in the U.S. have autism spectrum disorder (ASD), according to a new NCHS report released today. The report uses data from the National Survey of Children’s Health, which was based on reporting by parents of school-aged children (ages 6–17 years) in 2011–2012, and compared with earlier data from the NSCH in 2007. The survey was funded by the Health Resources and Services Administration’s Maternal and Child Health Bureau. The increase from 2007 to 2011–2012 was evaluated using cohort analyses that examine the consistency in the 2007 and 2011–2012 estimates for children whose diagnoses could have been reported in both surveys. ASD is a set of complex neurodevelopment disorders that include autistic disorder, Asperger disorder, and pervasive developmental disorder not otherwise specified. Children who have ASD display mild to severe impairments in social interaction and communication along with restricted, repetitive, and stereotyped patterns of behaviors, interests, and activities. 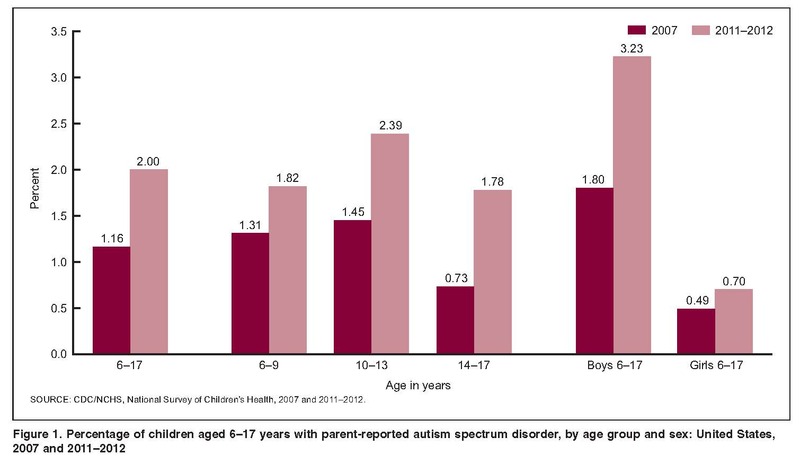 The report found that the prevalence of diagnosed ASD in 2011–2012 was estimated to be 2% for children aged 6–17. This prevalence estimate (1 in 50) is significantly higher than the estimate (1.16%, or 1 in 86) for children in that age group in 2007. The magnitude of the increase was greatest for boys and for adolescents aged 14–17. Cohort analyses revealed consistent estimates of both the prevalence of parent-reported ASD and autism severity ratings over time. Children who were first diagnosed in or after 2008 accounted for much of the observed prevalence increase among school-aged children (those aged 6–17). School-aged children diagnosed in or after 2008 were more likely to have milder ASD and less likely to have severe ASD than those diagnosed in or before 2007. This entry was posted on Wednesday, March 20th, 2013 at 6:26 pm and is filed under Uncategorized. You can follow any responses to this entry through the RSS 2.0 feed. You can leave a response, or trackback from your own site. Good blog you’ve got here.. It’s difficult to find quality writing like yours nowadays. I really appreciate individuals like you! Take care! !